Despite all the tall claims of development by authorities in India, the data from Government bodies shows that there are little, if any, improvements in tackling alarmingly high levels of malnutrition. Add to this the worrisome fact of a sharp increase in the indebtedness of households and the situation becomes even bleaker. The data from the National Family Health Survey (NFHS)-4 conducted from January to December 2016 with a whopping sample size of 601,509 households brings the facts out like little else does. It found 35.7 percent of children below five years were underweight, 38.4 percent are stunted and 21 percent are wasted. The data on wasting is one of the most worrying. It gives India the dubious distinction of being one of four countries in the world with 20 percent, or one fifth, of its children being wasted. The names of the other countries in this august club giving only a little relief are Sri Lanka, Djibouti and South Sudan. Look at the wasting data a little more closely. It betrays something else. 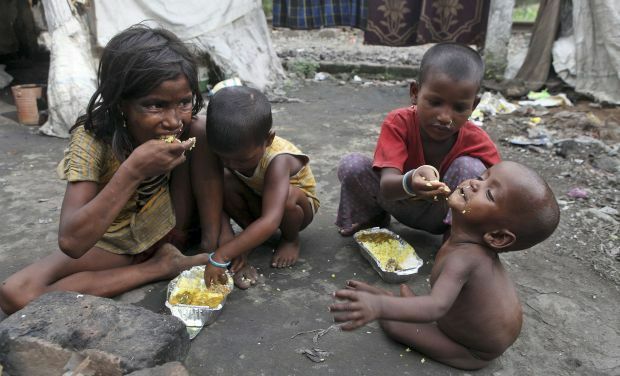 India is not only failing its children, it is failing the ones most marginalised and therefore most in need of support. The country has seen a small reduction in the three indicators of child malnutrition namely being underweight, stunted, and wasted. However, wasting among children has grown by one percentage point from 1990-1994, when it was at 20 percent. Sri Lanka is perhaps the only other country which has seen an increase in wasting among children. The prevalence of wasting among Sri Lankan children under five years increased to 21.4 percent from 13.3 percent in 2006-2010. Can the families of these children tackle malnutrition on their own? By both sheer common sense and data from Government Agencies, this is an impossibility. Which parents will let their children go hungry and become malnourished if they have the means to feed them properly? Recent data on household indebtedness shows that the number of families incapable of decreasing malnutrition have increased. All-India Debt and Investment Survey done by the National Sample Survey Office (NSSO) in the 70th round found about 31.4 percent of rural households indebted in 2013, up from 26.5 percent in 2002. Corresponding figures for urban households are 22.4 percent in 2013, up from 17.8 percent in 2002. Further demographic and regional analysis of the distribution of household indebtedness broadly follows the same trends as the distribution of malnutrition in the country. It exposes the reality that the more marginalised and underprivileged communities are, the more in debt, including non-financial institutions. A word of caution is needed here, though. Actually, indebtedness is not bad in itself. It might, in fact, even suggest upward economic mobility. But, it is not often the case with farmers and other under duress communities. This is evidenced by loan waivers being a primary demand from them. The linkage between indebtedness and farmers’ suicides is also underscored by a recent study commissioned by the Reserve Bank of India and conducted by researchers at Shiv Nadar University. The study is titled “Lives in debt: narratives of agrarian distress and farmer suicides. They found out that shame rising out of an inability to repay loans from kith and kin and friends is the single biggest reason behind rising farmers’ suicides. The study also listed faulty crop choices, rising input costs, and aspirational consumption patterns as other major factors driving suicides. Is there any hope for improvement in the situation in the near future? It does not seem likely. Government policy priorities reveal that child and maternal malnutrition are India’s most challenging health risks in the Economic Survey of 2017-18. It did set up a National Nutrition Mission (NNM) amid much fanfare with an allocation of Rs 9,046 crores (to be spent over 3 years from 2017 to 2020). Compare this with the Statue of Unity being built in Gujarat with Rs 2,989 crores (US$460 million) and the skewed priorities become apparent. And the NNM too had come 3½ years too late. In his budget speech in July 2014, Arun Jaitley, Finance Minister of India underscored the urgent need of “a national program in Mission Mode” to address the “deteriorating malnutrition situation in India”. He had then, rightly noted, that this was necessary as ‘present interventions are not adequate’. India required a “comprehensive strategy including detailed methodology, costing, time lines and monitorable targets.” He then proceeded to promise to put such a mechanism in place “within six months.” It is just that his six months took over three years and six months while children continued dying of malnutrition. This is another telling comment on the priorities of the Government. Even a cursory glance at the targets that the Government has set up for the NNM makes it look farcical! The mission had set up a target to reduce under-nutrition and low birth weight by a mere 2 percent each year. It will also strive to achieve reduction in stunting from 38.4 percent as per the National Family Health Survey-4 to 25 percent by 2022. That is an admission of India being okay with 25 percent or one fourth of its children being chronically malnourished up to 2022! The targeted reduction in anaemia-affecting more than 50 percent of Indian women and children-is even more absurd. The target, despite the fact that anemia and other nutritional deficiencies accounting for most of the neo-natal malnourishment cases is a mere 3 percent reduction annually. This is when 33.6 per cent of Indian women are chronically undernourished and 55 per cent are anaemic. That is half of the women in the child-bearing age! This alone predisposes their children to malnutrition. How many decades does the Government need to tackle and resolve malnutrition? Consider that fighting malnutrition makes a lot of economic sense! The World Bank estimated that India lost $22.64 billion (`1.50 lakh crores) to anaemia alone in 2016. That is almost three times the total health budget of India for 2017-2018. The budgetary commitment to the NNM is a mere Rs 9,046 crores or 1,340 million USD. The future will apparently be imperfect. That is, until the Governments gets its act together and puts taxpayers’ money where it is most needed. Fighting malnutrition in India requires a concentrated, coordinated and multi-sectional approach. It should be aimed at fighting agrarian distress, the issues of the urban poor and other marginalised communities by making them self-sufficient. It seems that this will not be happening anytime soon!